After witnessing a jobless high growth, Indian youth may hope to find millions of jobs in the textile, pharmaceutical, IT and other manufacturing areas. Finance Minister P. Chidambaram today announced a series of measures to boost employment in the manufacturing and agriculture sector. Reacting to the demand from the operators in the country’s civil aviation sector, Finance Minister P. Chidambaram has decided to extend the exemption available on aircraft lease rentals paid to foreign companies till September 30. Industrial chambers and trade associations today welcomed the Budget 2005-06 focus on infrastructure, textiles, manufacturing and rural development saying it would help sustain the growth momentum. 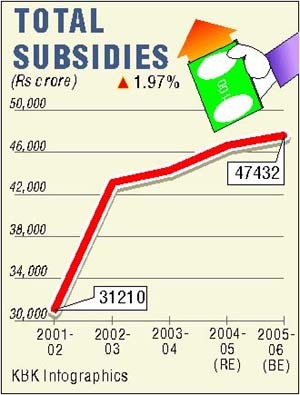 The government today enhanced the provision of subsidies by almost 9 per cent to Rs 47,432 crore in 2005-06. The food subsidy bill has been pegged at Rs 26200 crore, up from Rs 25,800 crore. Tens of thousands of personal income tax assessees may be forced to rework their tax savings plans as all sectoral caps are to be removed, the rebate under Section 88 and Section 80L eliminated and standard deduction completely abolished. Noting that the service sector accounts for about 52 per cent of the GDP, the Finance Minister P. Chidambaram today cast the net wide to include 21 additional services in the net. With the central government announcing a 65 per cent levy of excise duty of the maximum retail price on drugs the industries department is witnessing an influx of pharmaceutical investors in the region. Mumbai, February 28 Unveiling the roadmap for banking sector reforms today, the Reserve Bank of India (RBI) has laid out a two-phase programme for presence of foreign banks in the country through wholly-owned subsidiary (WOS) or conversion of existing branches into a WOS and acquisitions. The government today proposed a slew of measures for boosting the capital markets and decided to set up an Expert Committee to advise the government to make Mumbai a regional financial centre. Cellular phones have been removed from the one-by-six criteria for filing of income tax returns. “I propose to amend the one-in-six criteria for filing of income tax returns. 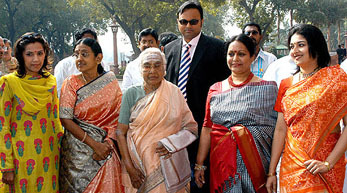 Mobile telephone will be removed,” Finance Minister P. Chidambaram said during his Budget speech. Amid growing realisation that core infrastructure sector holds the key to India’s economic growth, Finance Minister P. Chidambaram today proposed the creation of a special purpose vehicle (SPV) to fund infrastructure projects. Nearly 1.2 crore new jobs in textile sector by 2009. Additional 1 crore irrigated hectares to create 1 crore jobs. IT sector to create 70 lakh jobs over the next four years. Food processing to create 2.5 lakh jobs annually. Construction sector to create lakhs of jobs annually. Additional jobs in pharma, education and health sectors. Claiming to present a growth and employment-oriented Budget, he hoped that new packages for the agriculture, food processing, textile, IT and other sectors would create over three crore jobs in the economy in the next few years. New jobs will include around one crore in agricultural sector with the increase in area under irrigation by one crore additional hectares, 1.2 crore jobs in the textile sector, 70 lakh jobs in IT sector, and over 12 lakh in the food-processing sector over the next five years. Besides allocating additional budget for the National Rural Employment Guarantee Scheme, Sarva Siksha Abhiyan and new deal for the rural sector “Bharat Nirman” that are aimed at creating lakhs of jobs, the Budget is likely to give a push to the employment generation. Finance Minister said the government would allocate funds to create additional one crore hectares’ irrigation facilities in the rural areas. “We are hopeful to create jobs with the increase in irrigation facilities supposing that one job will be added per hectare after improved irrigation in the rural areas.” Increase in budgetary allocations for the education and health sector is also likely to create lakhs of jobs for the rural youth. Under Sarva Siksha Abhiyan alone, the UP government has given appointment letter to over one lakh youth. The post-quota regime, which has opened up new opportunities for the textile sector, has also been provided major incentives. The government has claimed that during the past one year, over Rs 20,000 crore has been invested in this sector, and another Rs 30,000 crore are likely to be invested next year. Duty on polyester and nylon chips, textile fibres, yarns and intermediates, fabrics and garments is proposed to be reduced from 20 to 15 per cent. Finance Minister announced to reduce customs duty on textile machinery from 20 per cent to 10 per cent, 10 per cent capital subsidy for the textile processing units, de-reservation of 30 textile items including hosiery, Rs 40 crore fund to set up 20 handloom clusters and increase in technology upgradation fund (TUF) scheme by Rs 435 crore. Recognising pharmaceuticals and biotechnology as sunrise sectors, Mr Chidambaram proposed to reduce the customs duty on nine specified machinery used in these sectors to 5 per cent He said the government would provide a stable policy environment and necessary incentives to help pharmaceutical and biotechnology sectors. In his Budget speech, Finance Minister also proposed to SSI sector to create additional jobs opportunities. Mumbai: Buoyed by the Budget proposals, the Sensex today surged by a whopping 144 points to end at a life-time high of 6713.86 on the Bombay Stock Exchange on across-the-board buying spree. Terming the Budget as market-friendly and growth-oriented, stocks brokers expressed optimism that the Sensex will breach 7,000-mark within a fortnight. After fluctuating erratically in a narrow range, the BSE Benchmark 30-share Index later rallied sharply to the historic intra-day high of 6,721.08 before ending the day at 6,713.86 as against last Friday’s close of 6,569.72, a net rise of 144.14 points or 2.19 per cent. Initially, operators and institutional investors had taken a cautious stance but later made heavy purchases despite their high outstanding positions in response to the budget proposals aimed at strengthening the capital market. In a major relief to corporates and taxpayers, the government proposed to lower corporate tax to 30 per cent and slash excise and customs duties on several commodities, including petro and diesel, and raise income tax exemption limit to Rs 1 lakh as well as restructured tax slabs. The securities transaction tax, introduced last year, however, has been raised marginally from 0.15 per cent to 0.20 per cent. Large-cap companies like HLL, RIL, Tata Steel, Infosys Tech, Wipro, Tata Motors and Grasim will be benefited substantially following the reduction in corporate tax. Bank shares hogged the limelight scoring impressive gains following a proposal to amend the Banking Regulation Act and the direction to the RBI by Finance Minister P. Chidambaram to prepare a roadmap for banking sector reforms. Also, customs duty on passenger baggage has been reduced from 40 to 35 per cent. The withholding tax exemption available on lease rentals paid to foreign companies effectively works out to about 20 per cent and increases the cost of leasing to that extent. The Finance Minister, while making the Budget speech, said, “In deference to the request from Air-India and the Indian Airlines, I propose to extend up to September 30, 2005, the exemption from tax on agreements to acquire aircraft or aircraft engines on lease”. The Budget proposal makes it clear that the exemption for lease payments would “continue with regard to agreements entered into on or before September 30, 2005”. “However, the benefit of exemption from tax will be available in respect of lease payments made in pursuance of agreements entered on or after October 1, 2005”, the Explanatory Memorandum on the Finance Bill said. The minister enhanced allocation for the Civil Aviation Ministry by about 62 per cent — from Rs 1473.03 crore last fiscal to Rs 2379.32 crore. Industrial chambers and trade associations today welcomed the Budget 2005-06 focus on infrastructure, textiles, manufacturing and rural development saying it would help sustain the growth momentum. However, it expressed concerns over the move to levy Rs 10 on withdrawals of Rs 10,000 on a single day from the banks. Ficci President Onkar Kanwar welcomed the cuts in corporate tax and the Budget’s focus on infrastructure and rural development. Chief mentor of CII Tarun Das said: “There are several positives. It is difficult to find any negative. Reforms are on track and we are on a good wicket”. CII President Sunil Munjal said: “Overall it is a good Budget, the announcements made are in the right direction in line with the expectations.” However, the Budget proposal to levy Rs 10 on withdrawal of Rs 10,000 on a single day did not appeal to the industry with Munjal terming it as “impractical” and Assocham President M K Sanghi saying “the move seems not to have been discussed properly”. Mr Amit Mitra, Secretary General, Ficci, said: “The Budget has come near our expectation. The special emphasis given to the textile sector is positive and will lead to employment generation. The Finance Minister has given equal attention to agriculture, construction and manufacturing,” he added. The decision to cut corporate tax for domestic companies cent is a positive step but the actual impact on the firm will only be to the tune of 1-2 per cent, he added. “Unless the transaction costs and cost of infrastructure is reduced, it would be difficult to achieve rapid expansion of manufacturing base,” Mr K.N. Memani, President, PHDCCI, said. Apparel Export Promotion Council (APEAL) also welcomed the package for the textile industry. The Gurgaon Chamber of Commerce (GCCI) ahiled it as a balanced Budget while the NC Chamber of Commerce and Industry described it as futuristic. Meanwhile, as per the agency report increase in excise duty from 12 per cent to 16 per cent on steel in the Union Budget 2005-06 would increase the cost to the customer, according to Indian Steel Alliance (ISA). The ISA, which was hoping that a stable regime would be maintained on the excise front, said the 4 per cent increase in excise duty would have adverse impact on prices of iron and steel particularly for industries where the Modvat benefits are not available. The government today enhanced the provision of subsidies by almost 9 per cent to Rs 47,432 crore in 2005-06. The food subsidy bill has been pegged at Rs 26200 crore, up from Rs 25,800 crore. The indigenous (urea) fertilisers subsidy bill for 2005-06 has been fixed at Rs 10110.37 crore, while the imported (urea) fertiliser subsidy bill is budgeted to be Rs 943.53 crore. Sale of decontrolled fertiliser with concession to farmers will cost the government Rs 5200 crore during 2005-06, while the petroleum subsidy bill has been fixed at Rs 3644 crore. Interest subsidies will cost Rs 383.52 crore, while other subsidies will cost the government Rs 950.82 crore for 2005-06. The rise in subsidy bill will increase non-Plan expenditure to Rs 3,70,847 crore in the next fiscal year. Meanwhile, the corporate income tax rate for domestic companies have been reduced to 30 per cent and will carry a surcharge of 10 per cent. The rate of depreciation will be 15 per cent for general machinery and plant, but the initial depreciation rate has been increased to 20 per cent. The requirement of 10 per cent increase in installed capacity for availing of the benefit of initial depreciation has been removed. Finance Minister P Chidambaram said to encourage technological upgradation, the withholding tax on technical services has been reduced to 10 per cent from 20 per cent. Credit will be allowed for the Minimum Alternate Tax (MAT) paid under Section 115 JB of the Income Tax Act. The Securities Transaction Tax (STT) has been raised marginally to 0.02 per cent from the present 0.015 per cent. Presently, the personal income tax assessees can avail of tax incentives under Section 88 in the several savings instruments, including life insurance premium, national savings certificates (NSCs), superannuation funds and tuition fees among others. Life insurance premium, (contributions are exempt under 88(2)(i). accumulations are taxed); deferred annuity plans (contributions are exempt under 88(2)(ii) and (iii)), provident funds (contributions are exempted under 88(2)(iv), 88(2)(v), 88(2)(vi)), superannuation funds (contributions are exempt under 88(2)(viii)), post office savings bank deposits (contributions are exempt under 88(2)(viii)), securities of the central government (contributions are exempt under 88(2)(ix)), national savings certificates (NSCs), (contributions are exempt under 88(2)(x) and 88(2)(xi)), ULIP of UTI and LIC mutual funds (contributions are exempt under 88(2)(xii) and (xiii)), annuities (contributions are exempt under 88(2)(xiiia)), units of mutual funds or UTI (contributions are exempt under 88(2)(xiiib)), pension funds of a mutual fund or UTI (contributions are exempt under 88(2)(xiiic)), deposit scheme of NHB (contributions are exempt under 88(2)(xiv)), deposits with HFCs, local development authorities (contributions are exempt under 88(2)(xiva)(a) and (b)), tuition fees are exempted under 88(2)(xivb). Currently, deductions, provided in Section 80L allow for exemption of income up to Rs.12,000- from income tax on specified financial instruments (including bank deposits, NSC, post-office deposits, government securities, etc. with an additional and exclusive sub-ceiling of Rs.3,000 for interest income arising from government securities). The tax saving proposals announced by Mr Chidambaram today do not clearly specify whether the tax assessees will still be able to avail of these benefits. The Finance Minister introduced the Fringe Benefits Tax which will be at the rate of 30 per cent on an appropriately defined base to tax the perquisites. There are many perquisites disguised as fringe benefits and escape tax. Neither the employer nor the employee pays any tax on these benefit which are of considerable material value. The Finance Minister has proposed that where benefits are usually enjoyed collectively by the employees and cannot be attributed to individual employees, they shall be taxed at the hands of the employer. However, transport services for workers and staff and canteen services in an office or factory will be outside the tax net. These include pipeline transport of goods, site formation, demolition and like services, membership fees of clubs and associations, packaging and specialised mailing services, survey and map-making services, dredging services in rivers and harbours, cleaning services for commercial buildings and similar premises; and construction of planned residential complexes, with more than 12 dwelling units and other services. The inclusion of new services in the tax net is estimated to yield Rs 17,500 crore in 2005-06 — up from Rs 14,150 crore in the current year. However, as a relief to the small service providers, the Minister proposed to exempt from service tax those service providers whose gross turnover does not exceed Rs 4 lakh per year. About 80 per cent of the present service taxpayers would gain from the exemption, he said. With the central government announcing a 65 per cent levy of excise duty of the maximum retail price on drugs the industries department is witnessing an influx of pharmaceutical investors in the region. Officials in the industries department revealed daily queries from Mumba- based firms including Smilex, Ankur Pharmaceticals, etc, which were proposing to invest in Himachal were being received. With the industry in Himachal receiving a 10-year outright excise exemption after announcement of the new industrial package in January 2003 this announcement has come as a shot in the arm for the pharma sector in Himachal. Officials of the Industries Department were now directed by the government to identify fresh land in the Baddi-Barotiwala industrial region, which could be acquired and converted, into industrial plots. Officials revealed that this exercise would ensure that investors were not fleeced by property dealers. With this announcement drugs manufactured here would be 50 -200 per cent cheaper than manufactured elsewhere in the region, opined manufacturers. While the levy of this added 65 per cent excise duty on the MRP would force the manufactures elsewhere to hike their ex-factory rates their counterparts in Himachal would be able to keep them much lower, a section of the investors said. Unveiling the roadmap for banking sector reforms today, the Reserve Bank of India (RBI) has laid out a two-phase programme for presence of foreign banks in the country through wholly-owned subsidiary (WOS) or conversion of existing branches into a WOS and acquisitions. It also stipulated guidelines on ownership and governance in private sector banks. Finance Minister P Chidambaram has proposed to authorise Securities Exchange Board of India (Sebi) to set up a national institute of securities market for teaching and training intermediaries in the securities markets and promoting research. In order to facilitate corporatisation of stock exchanges, the government has decided to grant a one-time exemption to them from stamp duty on the notional transfer of assets. Instead, payment for electricity of more than Rs 50,000 per year will be included as a criterion for filing a return of income, he said. Mr Chidambaram also said so far, the government has released Rs 1,700 crore to the Universal Service Obligation (USO) Fund, which has been fully utilised. A provision of Rs 1,200 crore has been made for 2005-06 for the USO fund. So far, 5.20 lakh village public telephones (VPTs) have been installed and the BSNL has undertaken to provide VPTs in the next three years to the remaining 66,822 villages, he said. “I propose to establish an SPV to finance infrastructure projects in specified sectors. Roads ports, airports and tourism would be sector that can benefit most from the SPV,” he said. The projects will be appraised by an inter-institutional group of banks and financial institutions. The SPV will lend funds, especially debt of longer-term maturity, directly to the eligible projects to supplement other loans from banks and FIs. The government will communicate the borrowing limit to the SPV at the beginning of each fiscal year. 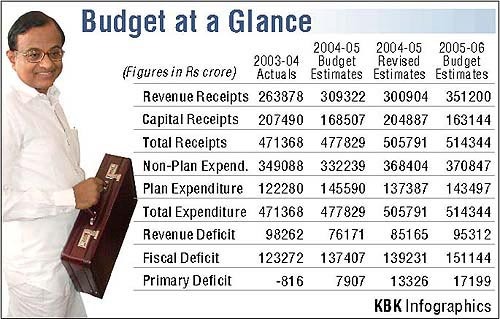 For 2005-06, a borrowing limit of Rs 10,000 crore has been proposed.